The Brooklyn Museum of Art in New York, houses one of the finest collections of pre-Columbian Andean art found outside Peru, including over a thousand textiles pieces, and a like number of ceramic, wood, stone, shell, and metal artifacts. Some of the museum’s most striking textiles are the large Paracas mantles, like this falcon-patterned piece. Although nearly 2,000 years old, the textiles are in surprisingly good condition, mainly because they spent most of that time buried on the arid southern coast of Peru. The falcon design was embroidered on the dark, plain-weave background fabric, after which the borders, woven and embroidered separately, were attached. The stitch direction conforms closely to the shape of the image sewn, giving a sense of motion and life characteristic of these early embroidered textiles. Another hallmark of these textiles was the visual duality of their imagery; here, for instance, the curved forms of the falcons give them a fish-like shape. Designs were also commonly drawn from the natural world and the museum’s collection contains various items decorated with feline, killer whale, and bird motifs. The Nasca ceramics have several elements in common with certain Paracas textile styles: both have bold, naturalistic imagery, date from around 200 a.d., and originate from southern Peru. The strong colors of these ceramics are outlined in solid black, often against a cream or tan background. The naturalism of their imagery, such as birds, killer whales, or fish, contrasts with the schematic quality of the designs. The Nasca vessels’ gently curving forms also give them a simple elegance. 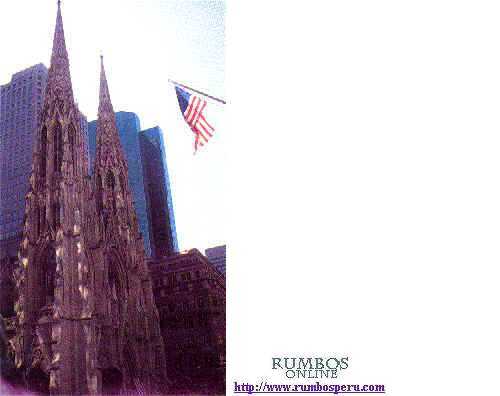 The designs and colors were created using different colored clay slips, or thick solutions of clay and water. 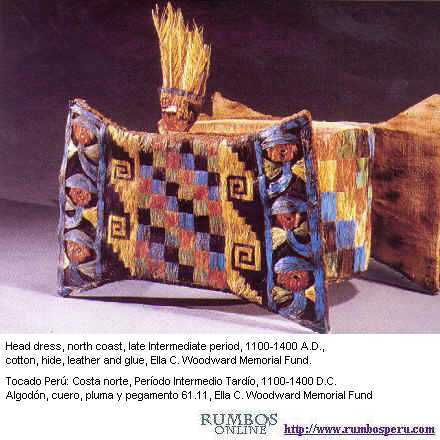 The museum has one unique Andean textile piece that displays many stylistic elements from both the Paracas and Nasca cultures. 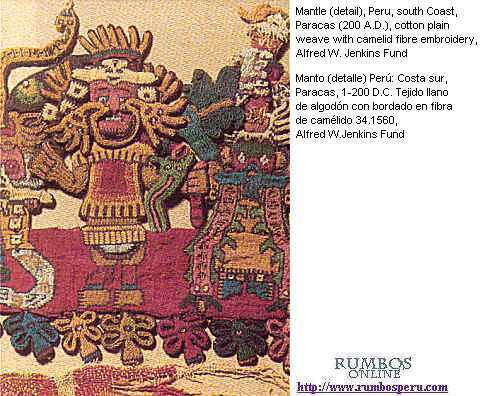 The Paracas Textile has a fascinating, unusual border decoration of figures achieved through a combination of two-dimensional embroidery and three-dimensional decoration in a process called needle knitting. The piece’s border and small size makes it unique in the museum's collection and indeed the world. 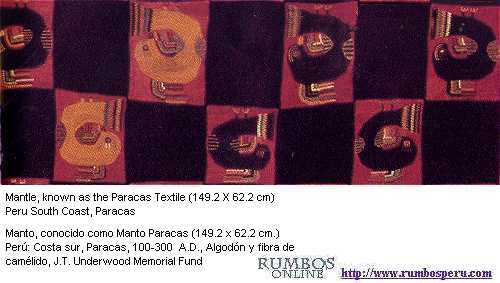 More than ninety figures grace the four sides of the Paracas Textile. Each figure differs slightly from the others, their line flowing seamlessly from two-dimensional legs firmly embedded in the flat textile body to three-dimensional torso. The border elements include humans in elaborate outfits and head-dresses; animals; and plant motifs, the whole creating a complex, active imagery that encapsulates the worldview of the culture that created it. The Brooklyn Museum of Art’s collection also includes early objects from northern and central Peru in a variety of media, with two pieces in particular standing out. 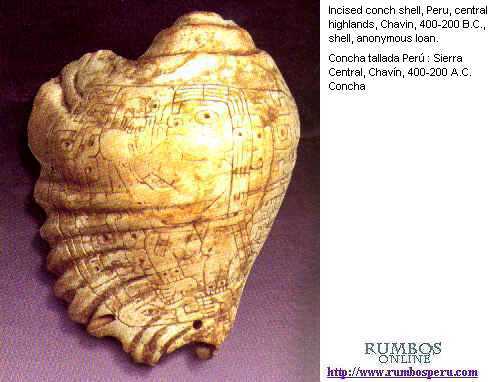 The Chavin style conch is fascinating for the delicacy of its carving and for its imagery. The conch displays a humanoid figure surrounded by several serpent elements and faces in profile. The central figure holds a conch similar to the one on which he is carved near his lips as if he were blowing into it. 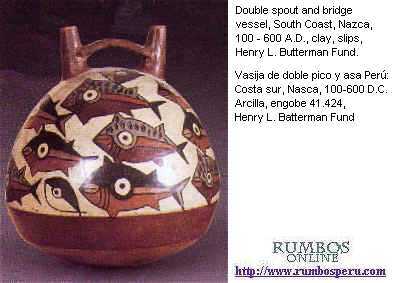 Such visual self-references are absent from the stone Cupisnique bowl, from Peru's north coast. The vessel’s decoration does, however, reflect the interchange between the Cupisnique and Chavin art styles. Serpentine forms and multiple fanged heads ornament the underside, recalling designs found on many large stone monuments at the Chavin de Huantar site in Peru. The Moche were another north Peruvian civilization, although they only inhabited the coast and during a much later period (100-700 a.d.). The museum has many examples of their naturalistic, mould-made ceramics vessels. Most of these are red and white in color, highly burnished, sport the characteristic Moche stirrup-spout, and are decorated with three-dimensional clay appliqués and/or slip painting. 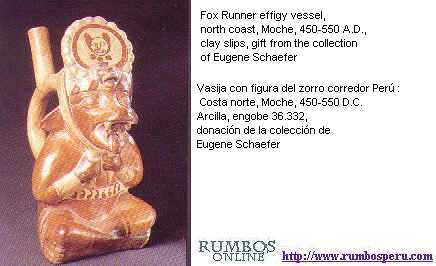 One example is the fox effigy vessel. The shape of the head-dress comes from the "bean runner" motif commonly painted on stirrup vessels. These running figures wear head-dresses and carry bags or pouches in an outstretched hand. This fox effigy appears to be a depiction of a runner from such scenes. 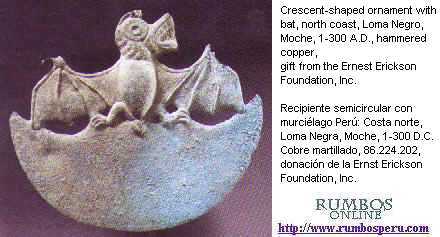 The Moche were also skilled metalworkers as the crescent form with the bat design seen here shows. The piece was hammered from a sheet of copper or a gold-copper alloy; the green coloration is caused by copper oxidation that occurred in its original archaeological context. Bats were a common motif in Moche art and possibly important in their supernatural beliefs. The Chimu were another, later, north-coast culture that flourished in Peru from 1150-1450. Like the Moche, their craftsmen were skilled in the use of metal and ceramics. Many Chimu ceramics have a distinctive black color achieved by firing rather than by applying clay slips. 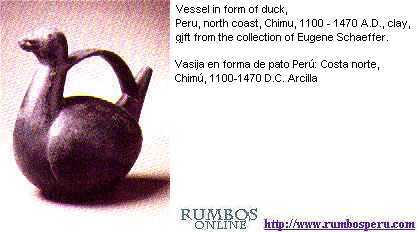 The museum has several Chimu ‘blackware’ pieces, including the duck effigy vessel shown here. A final, spectacular north-coast object on view at the museum is a many-hued, feather head-dress with a checkerboard pattern composed entirely of brightly-colored feathers. These plumes were taken from tropical birds that lived far from the coastal area where the head-dress was made between 1100-1400 a.d. Remarkably, the feathers have lost little of their original brightness. The Brooklyn Museum of Art's pre-Columbian collection is notable for the breadth of cultures represented and for the variety of examples. This fact, combined with the range of media, makes the collection a valuable resource for researchers and a must for anyone who wants to broaden their knowledge of pre-Columbian Andean art.